We were teased with a hint of Fall last week, with morning temperatures down in the 60s. This weekend it’s back to being warm, not too hot, but still warm. 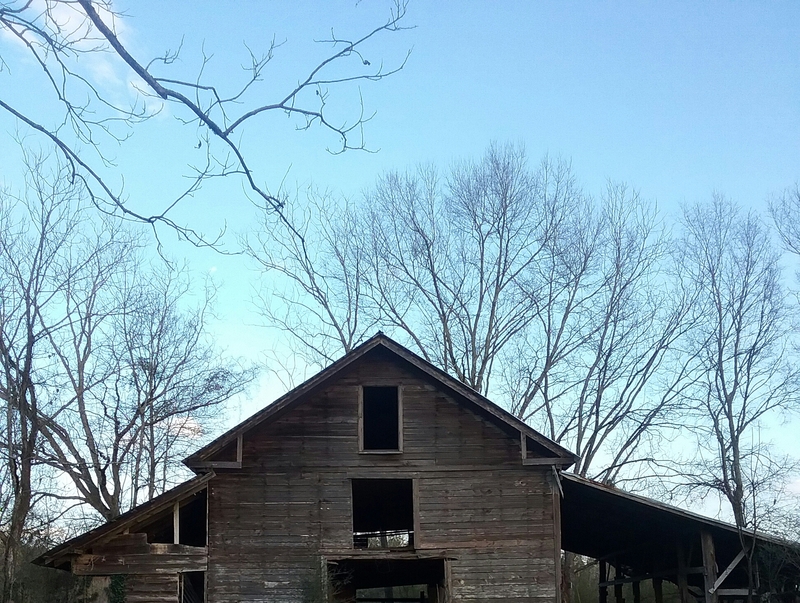 The skies have been glorious from horizon to horizon; blue like only September can create. 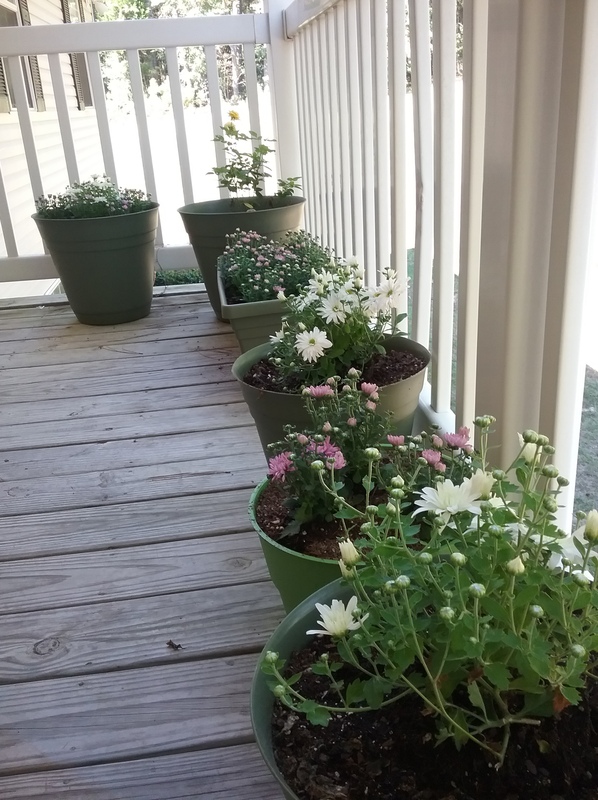 Pots of mums sit along the porch railing, like old friends come to visit. The hummingbird feeder has been getting lots of buzzes, as the migration has started. I’m cooking like crazy this morning. First was banana nut bread for the college man to take back to his dorm. 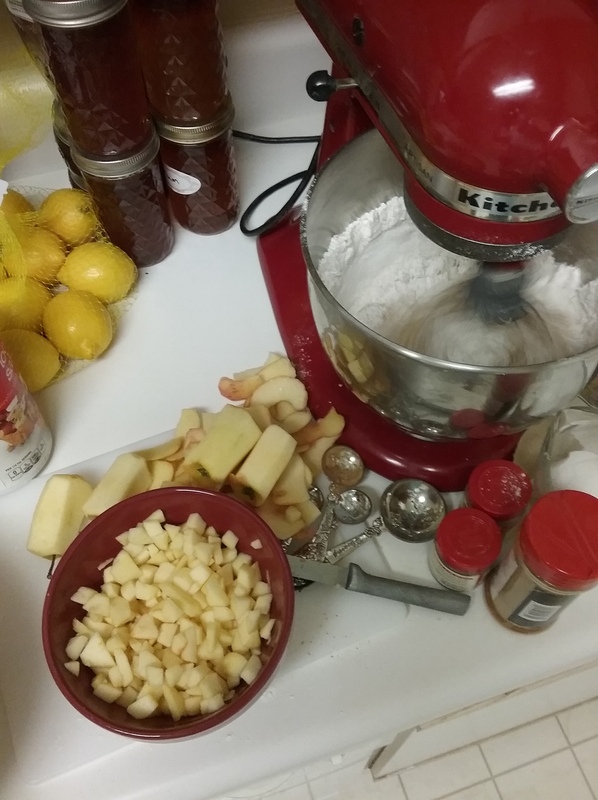 As that was baking, I put together one of my favorite recipes for Fall: Ms. Hudy’s Apple Cake. Mrs. Hudora Lewman is a long time member of our church and local historian.This recipe was included in our church cookbook in 2012. The cookbook was compiled for a fund raiser and also to celebrate the congregation being together for 150 years. 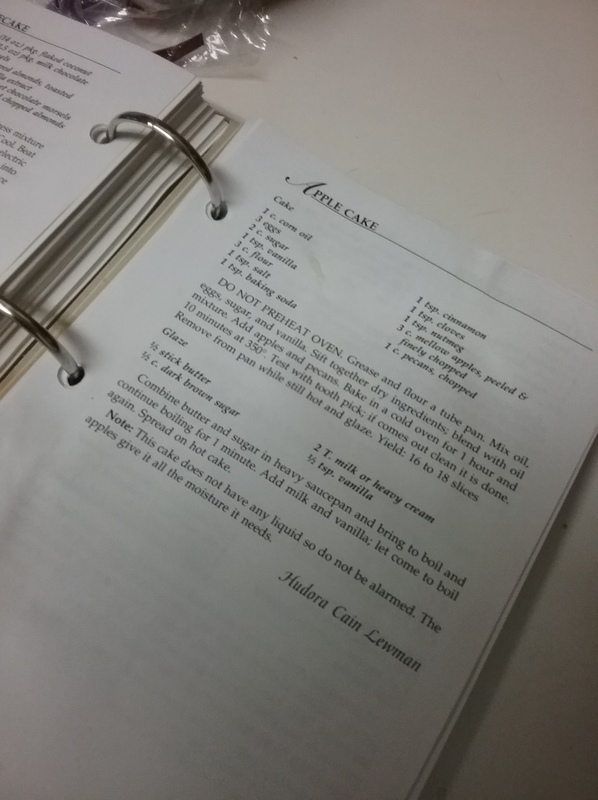 Ms. Hudy’s Apple Cake recipe straight from the cookbook. 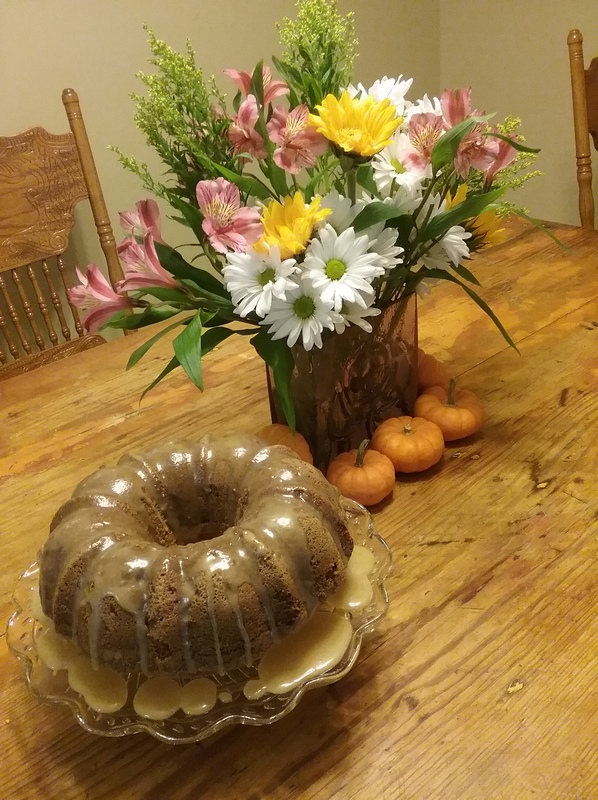 It calls for a glaze, and even though the cake is perfect without it, go ahead and gild that lily. 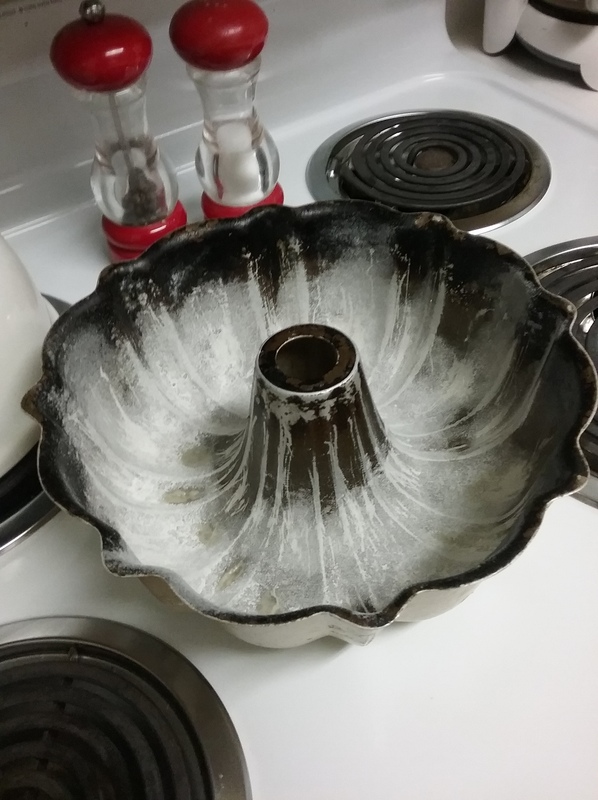 The most important step in the whole recipe is to grease and flour the pan. This cake is very dense and could stick to the pan without this step. It’s apple season. This recipe calls for 3 mellow apples. I used Gala apples because they’re a good apple for cooking and have a slight lemon flavor. As the apples were on the small side, I used 4 instead of 3. This cake bakes for an hour and ten minutes; don’t fudge from this step either. The apples need every minute to bake- this cake is so good and will make any house smell like home.